If you're a fan of carrot cake, then you'll LOVE these soft, sweet & nutty breakfast cookies! Make a big batch and freeze them for on-the-go treats. For a while, I went through a frittata phase, then there was the chia bowl phase, followed by a bit of a smoothie kick… which brings us to my current morning trend: cookies for breakfast! 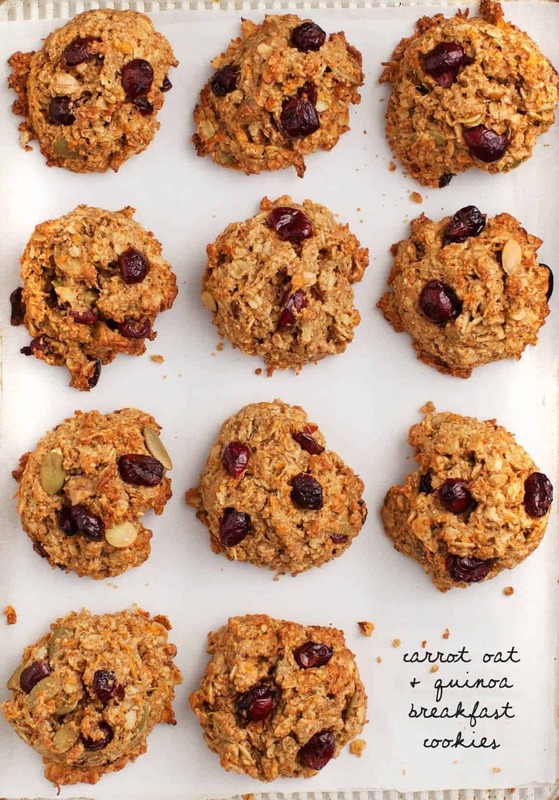 But before you think I’ve completely given up on myself, hear me out – I make these cookies with lots of good things – carrots, oats, flax, walnuts, pepitas, cranberries, and QUINOA. 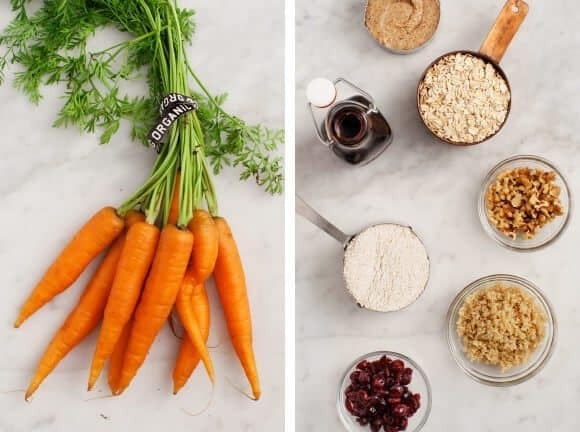 Yes, carrots and quinoa – it almost sounds like a salad, but I promise you these “healthier” cookies are so delicious and energizing in the morning. They’re also vegan, gluten-free, and sweetened with maple syrup instead of refined sugars. 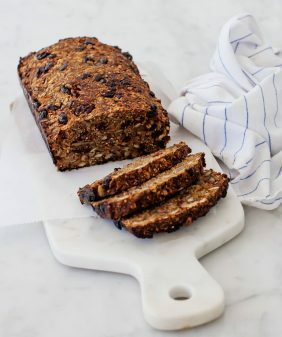 They’re about halfway in between a muffin and a cookie – big, hearty, and filling, but also sweet and nutty – they’re almost like eating carrot cake for breakfast! Let’s talk for a second about quinoa in cookies – I recommend that you use leftover quinoa here. I like to make a big batch of quinoa early in the week for easy toss-together lunches and dinners. Store your cooked quinoa in the fridge so that when you’re ready to bake these breakfast cookies, it’s ready for you. If you haven’t baked with oat flour before – it’s so easy. No need to go shopping for fancy flours, just blend your oats in a food processor for about a minute, and you have oat flour. It’s gluten-free, but be sure to seek out certified gluten free oats if gluten is a problem for you. Over here, my family is obsessed with these. They’re best straight out of the oven, but they also freeze incredibly well (hence, my 1 cookie per day breakfast obsession). These vegan breakfast cookies make a great quick breakfast or healthy snack! 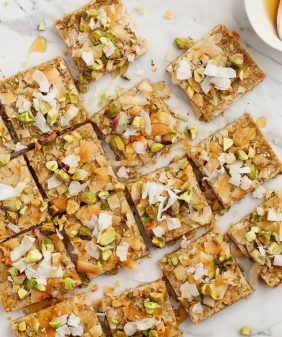 Made with carrots, quinoa, and oats, they're naturally sweetened and gluten-free. Use a food processor or a blender to process the 1¼ cups rolled oats into a fine flour and measure out one level cup. In a large bowl, stir together the flour, the remaining 1 cup whole oats, baking powder, baking soda, cinnamon and sea salt. Fold in the quinoa and then the shredded carrots, stirring until the carrots are completely coated with flour. 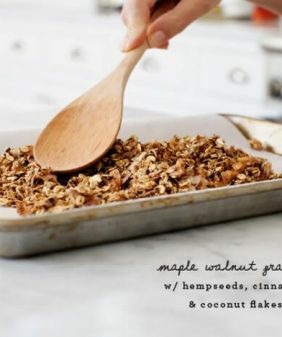 In a small bowl, combine the flaxseed and warm water and set aside to thicken for about 5 minutes. In a medium bowl, combine the almond butter, coconut oil, and maple syrup and stir well to incorporate. Stir in the flaxseed mixture. Add the wet ingredients to the bowl of dry ingredients and fold in just until combined. Stir in the walnuts, pepitas, and cranberries. Scoop about ¼ cup of batter for each cookie onto the baking sheet. Bake for 15 to 18 minutes, or until lightly browned. Cool on the pan for 5 minutes and then transfer to a wire rack to finish cooling. *Be sure to use certified gluten-free oats to make these gluten-free. You had me at cookies for breakfast! I love quiona, but haven’t tried it in cookies. I will for sure now. Thanks! I love the idea of a healthy breakfast cookie – sounds like you’re getting away with something pretty decadent but it’s actually good for you! Can’t wait to dive into a batch of these beauties! I love your receipes but would also like to see a calorie and saturated fat count. What can I sub for oil? I don’t use it. Can I sub with mashed bananas? Hi Diane, I haven’t tried these with mashed banana, so I can’t guarantee the results. But let me know if you give it a go! Try mashed Avocado. I use that instead of butter all the time. Won’t change the taste. I used 1/2c. of applesauce, peanut butter instead of almond, and goji berries instead of cran…. and it worked really well. You used 1/2 c of apple sauce instead of what? I entered it into MyFitnessPal and this is what came up. There are very good online nutrition counters. You just put in the ingredients and they deliver the nutritional breakdown. Caloriecount.com and others. Just google! I would make the breakfast cookie in a savory version. On the premise that once you eat something sweet, you want something else sweet, we are trying to avoid all sugar until later in the day. Protein and complex carbs (which are sugars but which take a long time to metabolize) for breakfast. That looks gorgeous! I love this idea – what better way to start the day than with cookies?! Yum, I had a breakfast cookie kick a while back, too! Flax eggs seen like a natural in nubby, chock full bakes like this. Hadn’t thought to add carrot, but these look totally great! So excited for these cookies. They look amazing. These sounds great post workout, good amount of protein. What a greay way to start the day! Obsessed!! Any day I can eat cookies for breakfast that are actually healthy, it the new best day ever! I have to try these! There are mornings when my poor husband runs out the door with a piece of peanut butter toast wrapped up in a paper towel, and that’s his breakfast. guess it’s time for me to work with/cook quinoa after all! Breakfast cookies are already ‘on my radar’ and get cooked as take-alongs for camping, road trips, ski trips and more! That sounds wonderful. Do you use steel cut oats? What is in your cacao avocado mousse —sounds sinfully delicious! Hi Barbara, no, I use whole rolled oats (Bob’s Red Mill Gluten Free Whole Rolled Oats, specifically). The avocado mousse is in the cookbook – it’s similar to the frosting on these cupcakes: https://www.loveandlemons.com/chocolate-cupcakes-avocado-frosting-vegan/ Hope that helps! Cookies for breakfast???? Um…………YES PLEASE! You can count me in for these healthy yummies for sure! These look incredible, thank you so much for the recipe, love the use of carrot also, cookies for breakfast, YES PLEASE. These sound amazing! I also go through breakfast phases, and cookies for breakfast has been one of them. I was thinking it’d be good to throw quinoa in a recipe like that, and now you’ve gone and done it. Can’t wait to try these out! What a great way to get so much goodness into one bite! I eat a lot of cookies for breakfast – not the good kind – so thank you for this! Looking forward to trying. And congrats on the book! Where can I find nutritional info on this recipe? Looks delicious. I will try them since I am always on the hunt for new breakfast ideas. I usually eat oat banana coconut pancakes – they are also very yum. 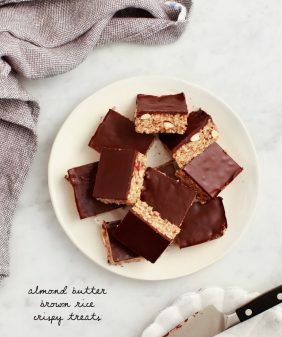 These are a very worthwhile and satisfying way to use up nut butters! I used tahini, because that is what I had on hand, and replaced maple syrup with honey, coconut oil with walnutoil, and added cardamom in addition to cinnamon. I ground the carrot with the 11/4 cups of oats in food processor (lazy solution to avoid grating), and it worked really well. These cookies look delicious!!! Thanks for sharing! I’m definitely going to make these for breakfast this weekend. I’ve been looking for any alternative to my usual! Thanks for the great post! Okay Jeanine – I blame you!!! I thought, “Oh, I’ll give ’em a try..” and in one week I’ve made this recipe 4 times! I don’t see why these aren’t good for me, but eating as many as I am (I’ve been sharing with my staff) they have to be bad. My worst problem is that i keep eating the raw dough. Okay, but serious a couple of thoughts. I have never had all of the ingredients so I’ve made a ton of substitutions…different in each batch. I’ve been using millet instead of quinoa sometimes, and the nuts and fruit keep changing. You mention finely shredded carrots – how are you doing this? My box grater has a fine option but the carrots never work in it. So I just use the course holes which seems to work fine. But if there’s an easy way to get fine I’d like to try it. Thanks again – love these! Hi Rob, (sorry for my slow reply! I somehow missed seeing your comment when it first came through). Wow, 4 times! I’m glad you like them and I’m glad they’ve worked with millet, etc. I use a mircoplane grater, (this kind: http://amzn.to/1MqofTr) which is sort of in between the 2 types of holes on a box grater. I’ve also pulsed them in my small food processor until they’re crushed up, which is quicker. Hope that helps! About how many carrots is a cup shredded? It depends how big your carrots are – about 2 large or 3 medium. Just be sure to measure after you grate them. Rob, I put a bunch of baby carrots in my ninja blender and gave them a whirl. The carrots chopped up great! (or should I say “grate”?!) I wasn’t sure if there’d be enough liquid for them to blend but they were fine. I was ready to add a little scoop of applesauce and the flax-and-water mix if needed for blending purposes but it wasn’t necessary. This is also how I blended the oats — just measured in the 1.25 cup, blended up, and then measured the oat flour to be sure I had 1 cup as I poured it from the blender cup into the bowl. I used the ninja’s smaller add-on blender container to do this; I don’t know how it would work in a standard-size blender pitcher. The carrot results are probably smaller/finer than the grating version, but they measure/taste/cook the same. I don’t have a food processor but I imagine that would make quick work of the carrots, too. These cookies are so so good! I made a batch a few days ago and they barely lasted 24 hours in my house. I recently got this chai spice blend off of etsy and have been including 1 tsp of it into the recipe and it really puts them over the top! I would highly recommend it! Thank you for this recipe… seriously so yummy! I’ve been meaning to tell you that these have been my go-to breakfast during the past week of our renovation. I added some extra oats and skipped the baking (and leavening) and they make hella delicious no-bake oat bars. 😉 So excited for you guys and your cookbook! High fives, you two! How yummy! Especially with almond butter and all the goodies. Sounds great! Ha, yea they’re easy to keep eating! So glad you liked them!! These are holy cow amazing. My 1 year old loved it. My husband said they could be a bit sweeter but they’re good. Then he ate 3 and I had to tell him to stop so that we’d actually have some for the week. HA, love hearing that, thanks!! What can I use if I don’t have any almond butter on hand? How many calories in each cookie? love your blog and your book, it’s gorgeous. i wanted to know what nut would be a good substitute for walnuts: despite trying them time and time again i just do not like them. pecans? almonds? other? Hi Sarah, thank you!! I’d use pecans, they should swap in just fine here! So update to this question – my kid started at a school that doesn’t allow nuts. If I swap the almond butter for sunflower butter that’s fine but instead of walnuts and large sunflower seeds (that she doesn’t like), what could I use? Hi Sarah, I don’t really think there’s a good swap for the texture of nuts, you could try leaving them out? Although, note that when you combine sunflower butter with carrots there’s a funny (although not unsafe) chemical reaction that makes these cookies turn green. These are really good and make me feel so much better about the out-the-door breakfast that my teenagers usually have. They bake up really nicely. I like that they don’t spread, but rather stay mounded in the oven. I’m not accustomed to cooking gluten free, and have one question. The baked product is a little softer than I would like. Would adding some portion of coconut flour help? I read today’s post about the raspberry scones and your comment that coconut flour absorbs moisture and helps to make the scones dense but not dry. What do you think about that addition to the breakfast cookies and how would you do it? Hi Jennifer, glad your teenagers have been liking them! They’re supposed to be soft cookies – with this many oats and carrots, they’re not going to get crispy. That being said, to get a little crispness on the outside, you can either bake them a little longer or toast them in the oven on the second day until the outside has a crisper texture. I wouldn’t suggest using coconut flour for this one, I think it would make them a little too dry and/or might make them fall apart. They are simply great! I tried with butter of different nuts and it works out well. Baked walnuts give something really special for my taste. These cookies are perfect for a mid day snack. Thank you. Many other good recepies on your blog. 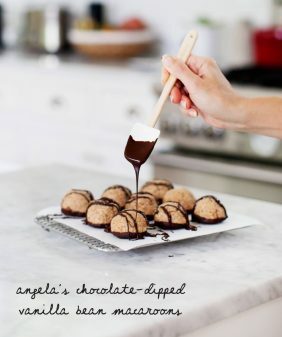 I just found this recipe while exploring you blog (I go through it whenever I’m in need for a recipe, it’s perfect:) ) and going to try these today! I’ve been looking for a breakfast cookie for a while and I have all the ingredients. Wish me luck! Mine turned green… What did I do wrong? Hi Jennifer – the only thing I can think is that maybe your pepitas were crushed/chopped and not completely whole? They’re the only thing that’s green in the recipe that might affect the color. I also used sunflower butter!! Mystery solved!! Thanks so much, your follow through and knowledge (and delicious food) have made this my favorite food blog! aw, thank you! So interesting (and weird) to know that sunflower seeds can have that reaction! Hi Jennifer – I just found this info about why carrots could turn green and wanted to share: http://www.thekitchn.com/food-science-when-good-carrots-52210. Make sure your baking soda is fully mixed in or you can try reducing it by 1/4 teaspoon. Hope this helps! I usually never post comments on recipes that I make from websites but I really wanted to let you know how much I love this Genius recipe. Ever since you posted it I have made it twice a month and bring two to work each day for breakfast. I have to portion it everyday or else I’ll end up eating the entire batch in one sitting. For any future bakers out there that want to deviate from/experiment with the recipe I just wanted to share my tips/substitutions with you/them! 2) I never used almond butter for this recipe. I have used natural (no salt) peanut butter and tahini/sesesame paste. As a PB love the flavor is definitely noticeable. 3) I have substituted maple syrup for (local) honey, and I prefer the sweetness of the maple syrup (more pronounced in sweetness and flavor) for this recipe. If anyone wants a subtle sweetness with no pronounced flavor, try using golden blossom honey (not the “honey bear” honey). 4) I have never used cranberries (never on hand) and have substituted it with currants (my go-to instead of raisins). Always delicious. Hi Robyn! Sorry for my slow reply – thank you for commenting :). I’m so glad these are a part of your regular routine and thank you for sharing your successful modifications! I love the taste of the cookies. Unfortunately they aren’t as hard as they should be even after 25 minutes in the oven. I substituted the coconut oil and the almond butter with magarine. Any tips on how to make their texture more steady? Best wishes and thanks for the wonderful recipe. The almond butter and coconut oil are an important part of the texture. I would suggest trying out the original recipe. Hope that helps! I made these yesterday and they are very tasty! One question though – I left them out in a ziplock bag overnight and this morning something in them had turned green. They still taste fine and I don’t see how they could have developed mold overnight, right? Does the flaxseed change color? I followed the recipe, except added sugar instead of maple syrup, and sunflower butter instead of almond butter. Any ideas? Hi Emily – a few comments up someone else had this issue – it’s not mold (they’re safe to eat) but check out this link: http://www.thekitchn.com/food-science-when-good-carrots-52210. Apparently carrots can have this reaction with baking soda and sunflower seeds. If you use almond butter, they shouldn’t discolor. These are so delicious! My twin 1.5 year olds can’t stop shoveling them in their mouths. They make the perfect healthy daycare snack. Question: can I freeze them? I’m so glad they loved them! Yes, they freeze really well! I’m sorry, but this recipe is terrible! How healthy can a recipe be when you eat half of the batch???!! Lol! These are surprisingly additicting! And it’s nice to know I’m getting some good stuff in while nursing my 6 month old. Also, my 2 year old loves them too!! The only change I made was using LIVfit superfood blend in place of the flaxmeals because I had none(I know, I live under a rock). And my food processor made quick work of those carrots! Thank you for sharing this!! I’ll be coming making thus again and again and again!! These are so amazingly delicious! I made them for my daughter who is gluten and dairy free. She loved them, as did the rest of the family!! I used peanut butter instead of almond butter b/c it was what I had on hand. Also, did need to cook them longer than recipe stated to get them firm, but hardly a problem. My daughter is begging me to make these again. Thanks for a great recipe! Made these last night for the first time. Very yummy and not too sweet. I used normal butter (melted) instead of almond butter so not vegan but like the idea of trying peanut butter or tahini next time. They tasted even better after a night in the fridge. I had to convert the American cups into metric measurements so it took a bit of time and I’m sure I was very approximate on quantities but it seemed to work. Love the idea of oat flour from oat flakes – I had no idea it was so simple! These looks perfect! If I don’t have flax, how do I replace with egg? Thanks! Aw, yay, I’m so glad to hear that he approved :). Hope you both enjoy the Hazelnut Milk as well! First of all, this is NOT my kind of cookie. And yet, I was drawn to the recipe over and over since its post. So, I made them today. Holy mother of deliciousness, they are GREAT!! The only sub I made was to use sprouted watermelon seeds in place of pepitas. I did bake them longer than specified, perhaps another 15 minutes for crispy edges and then cranked it to 375 for another 5 minutes. Outsides crispy, still soft-ish in the centre. Just the right amount of sweetness for my taste. I’ve never been happier to be wrong. Extra quinoa in the fridge so I see another bake in the near future. Thank you so much! Hi, I made these and the texture is very crumbly when you bite into it. They fall apart. I made them as the recipe states, baking 18 minutes and using dried cherries and pepitas for the fruit but combo. Any ideas? Should inhale them longer? Hi Sherri, these are on the crumbly side – but I would recommend baking them a little longer and/or letting them sit on the pan longer to cool before trying to pick one up. Hope that helps! 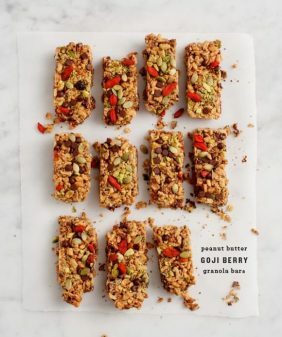 Hi, I’m just wondering how exactly you are cooking your quinoa for this recipe and if you could specify, it might help as it could have some impact on the texture (crumbly vs VERY crumbly) of the cookie that some people are experiencing. Personally, when I cook my quinoa for salads, etc., I use a 1:1 ratio of Water to quinoa so that my grains come out separate vs more on the mushy side. However, for this recipe, I’m guessing you want it more mushy so that everything binds together and hence are probably using what many folks do, a 2:1 ratio of 2 cups water to one of quinoa. Could you please clarify? Thank you. P.S. Since my previous post I have made three double batches of these cookies. Love! Made these to the recipe, and they are a hit with the whole family. Only change I would make next time is to omit the chunky things – cranberries (as the cookies are on the crumbly side anything big in them just encourages them to break up, also my son thought cranberries baked were ‘too chewy”) and chopped nuts. I think keeping the mix finer (seeds, finely chopped nuts) will make them bond better. I might try doing a thumbprint of jam in the centre next time. Brilliant recipe, thank you! Hi Amy, I’m so glad you liked the recipe! Also, if you try baking them a tad longer they aren’t as crumbly. These cookies are so delicious!! Even my toddler loves them! One issue I had was that they fall apart very quickly in little hands, would it be possible to add eggs to these? Could I add an egg in addition to the flax, or do I need to remove the flax? I’m so glad your toddler loves them! I haven’t tried these with an egg so I can’t say for sure for sure, but I’d skip the flax + water and use 1 large egg instead. And/or, try baking them a little longer – closer to the 18 minute mark and see if that does the trick. So yummy, convenient, and flexible to make! These healthy treats will be a constant in the household and on the golf course (my partner is a professional golfer). Made them today and I couldn’t stop licking the bowl before they went into the oven. That’s when I knew that they gonna be amazing and they are! Absolutely love them. So delicious and sweet. Might make them less sweet by adding less maple syrup next time, cause the carrots and almond butter add a bit of sweetness as well. I used canola oil instead of coconut oil and left out the cranberries and seeds, due to a fussy little one at home. But I’m sure she’ll love them as much as I do. Hi Dani, I’m so glad you loved the cookies!! These are amazing! I did make some less healthy substitutions based on my preferences. I didn’t have enough rolled oats so I subbed the oat flour for regular flour which i reduced by a 1/4 cup. I also subbed chocolate chips instead of cranberries to make these more appealing to my husband ha ha!